We offer the most authentic Reiki training available today. The information is this Reiki class has been passed on unmodified from the original tradition. Our training includes plenty of hands-on practice, so that you feel confident in your Reiki skills. You will be taught directly by Dr. Danilychev, MD, a Medical Doctor, who is also a Jikiden Reiki Shihan (Reiki Master/Teacher of traditional Japanese Reiki) certified by the Jikiden Reiki Institute in Japan. 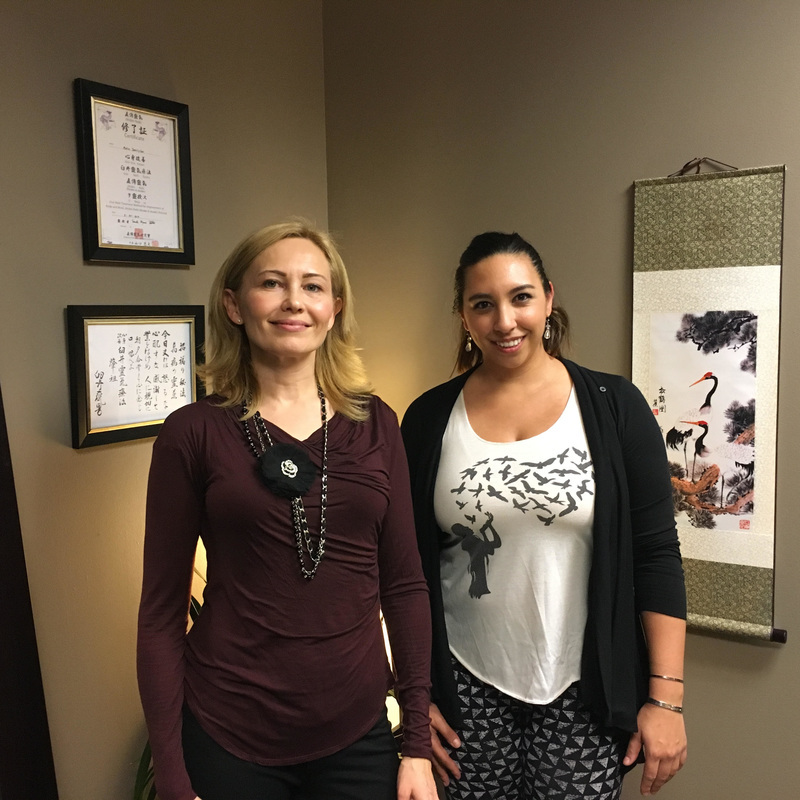 We offer ongoing supervised practice training during our weekly practice meetings, which will help you maximize your Reiki ability. You will be given easy access to hospice volunteer opportunities at the doctor's hospice and other organizations. Most dedicated students will be offered an internship position with prospective employment at San Diego Reiki. ​Reiki is a beautiful holistic healing art that originated in Japan. It improves wellness on a mind-body-and-spirit levels and it is easy to learn - anyone can develop a Reiki ability and classes are only a few days long! Reiki will always be there with you, and you can use it on yourself as well as to help others. 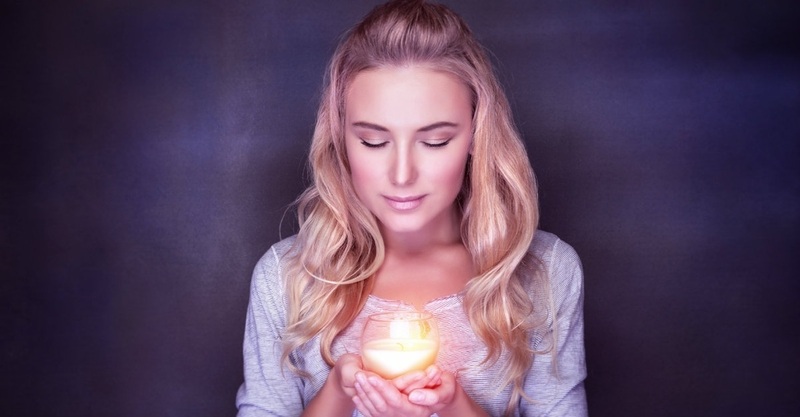 ​Most people feel that learning Reiki has changed their lives for the better. It is quite amazing, actually! 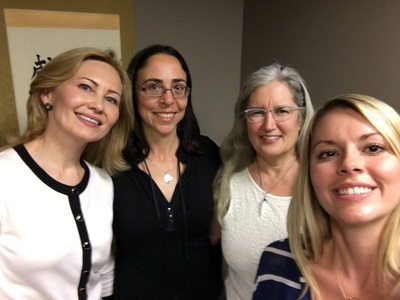 Meet Dr. Maria Danilychev, MD - the only western medicine doctor in the U.S., who is also a Jikiden Reiki Shihan (Master Teacher)! 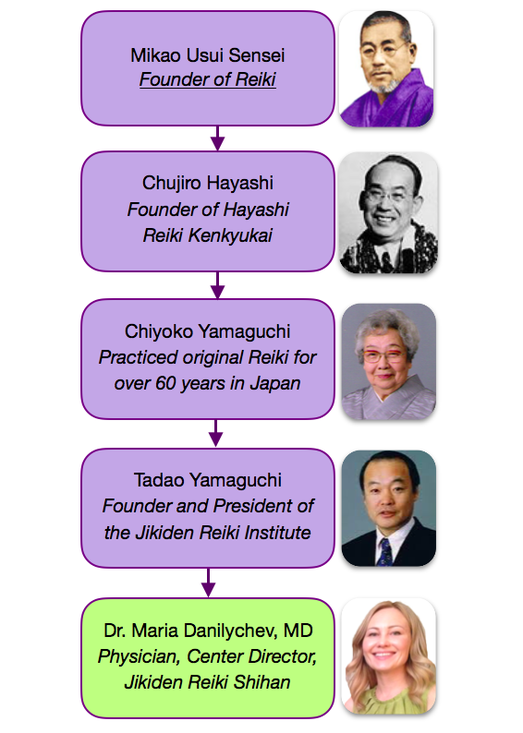 While the vast majority of Reiki teaching has been Westernized (at least to some degree), Jikiden Reiki has been preserved and maintained in its original tradition by the Jikiden Reiki Institute in Kyoto, Japan. ​​Essentials of Reiki, first Reiki symbol, Reiki History, Reiki Principles, techniques to practice at home. SHODEN. To learn only the basics of Reiki, you can take just Shoden (Level 1) class. Shoden covers the essentials of Reiki, but by itself is considered a partial Reiki training. Please note, that Shoden is the essentials of Reiki the way it was originally taught in Japan, so it is a lot more traditional than classes called 'Reiki level 1'. ​SHODEN and OKUDEN. If you'd like to get complete training and to become a Certified Jikiden Reiki Practitioner, you would need to take Shoden (beginner level) and Okuden (more advanced, deeper level). Just as Shoden is more traditional than 'Reiki level 1' classes, Okuden is a more traditional form of what many call 'Reiki level 2'. SHINPIDEN (Shihan-Kaku and Shihan - teacher levels). Those students who have been practicing for a while, and who are interested teaching Jikiden Reiki, can complete Shihan-Kaku training (can teach Shoden) and Shihan training (can teach Shoden and Okuden). It usually takes a few years to become a Shihan (Reiki Master Teacher), but it is by no means mandatory. It is not about achieving the highest level. You can be a highly qualified expert Jikiden Reiki practitioner without pursuing a teacher's (Master) level. ​Upon completion of each level, you will receive an official Jikiden Reiki certification, from the Jikiden Reiki Institute, in Japan. It is a very special certification, since you will receive the same type of certificate that was once granted by the founder of Reiki Mikao Usui. Already a Jikiden Reiki Practitioner? Join our weekly practice meetings! 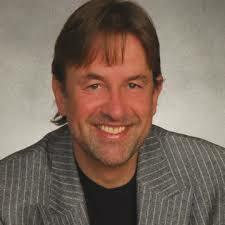 If you have completed any of the Jikiden Reiki seminars with any other teacher, you are welcome to join practice meetings with Dr. Danilychev. Most of the practice meetings are held on Monday evenings, 5pm-7pm. You can also review Shoden and Okuden with Dr. Danilychev (please email healing@sdreiki.com for repeating student discount). *IMPORTANT, you must have a valid Jikiden Reiki certificate and attendance card in order to attend practice meetings and review seminars. Ready to Become a Reiki Professional? We are now also offering ADVANCED TRAINING courses for Reiki practitioners of any Reiki style. In these classes you can learn all the essentials of how to create your own Reiki practice, from getting special Reiki practice tips, to learning which consents must be used (by law) by all Reiki practitioners, as well as learning about common illnesses seen Reiki. CLICK HERE to learn more about our Advanced Training. Want to Have a Thriving Reiki Practice? Dr. Danilychev is now offering personalized one-on-one coaching to help you along your Reiki journey. CLICK HERE to learn more and sign up. "The beauty of Reiki is in its simplicity. Anyone can learn it and can apply it in everyday life. You can use it on yourself, your family and friends, and you will discover that having Reiki ability is truly amazing! 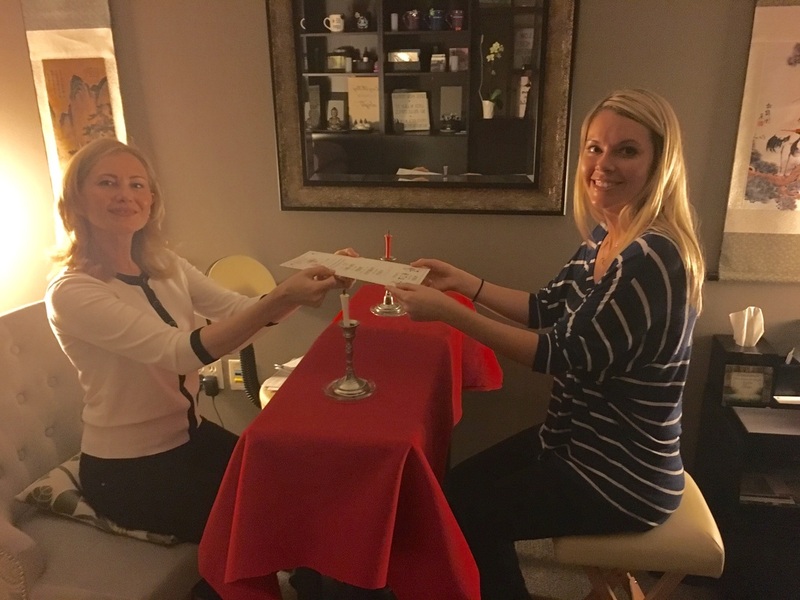 Whether you are new to Reiki or already practicing other styles of Reiki, I am sure you are going to enjoy learning this special healing art in its original Japanese tradition. I can't wait to see you and share this gift with you!" If you are interested in learning Jikiden Reiki, but you've never had it before, you can come in for a Taiken-Kai, which is a free Jikiden Reiki experience session. ​These sessions often coincide with our practice meetings, which will give you a special opportunity to meet our graduates and to experience Jikiden Reiki from several practitioners at the same time. ​Email us at healing@sdreiki.com to reserve during our Practice Hours (normally held on Thursdays 5-7pm and Fridays 10am-12pm), or CLICK HERE to book a Taiken-Kai during any other available time. Best students can interview for a Reiki Practitioner position at San Diego Reiki. Please visit CAREERS section of this website to learn more. Want to dive in, but not sure where to start? Visit our amazon store and get the most essential Reiki books that any Reiki practitioner should be familiar with. ​Consider starting with "This is Reiki" and "The Light on the Origins of Reiki", while leaving the other books for later - they will make a lot more sense after you complete the Reiki training. ​Questions? Please ask. We are here to help!